"Blame It On Me" Reviewed by RadioIndy.com! 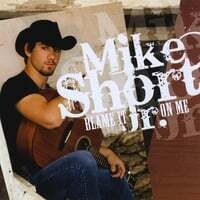 Mike Short Jr’s terrific debut CD, “Blame It On Me,” is that rarest of 21st century Country and Western albums: it’s full of genuine country music. The fiddles are pure Nashville, the piano is authentic honky tonk, the guitar tones are patented Fender, and Short’s plaintive, down-home vocals recall classic singers with names like Merle, Garth and Buck. Granted, there’s enough contemporary country-rock sheen to make songs like the up-tempo “Good Guys Wear Black” and “Lady in Waiting” completely radio-ready, but such studio polish can’t hide the deep country underpinnings that make this 12-song collection solid from beginning to end. Bookended by the soulful delivery of opening track, “Who’s to Blame,” and the solemn tones of the final song - the excellent ballad, “Soon I’m Comin’ Home,” Mike Short Jr’s hook-filled “Blame It on Me” CD touches all the bases on an album for listeners who still appreciate true country singers and real country songs. FANS - Please checkout Mike Short Jr iTunes page play / purchase some great new music! Radioindy has published Mike Short Jr CD Review to lala Music Online. FANS - Please checkout Mike Short Jr la la and play / purchase some great new music! RadioIndy is pleased to announced that we have published our CD Review of Mike Short Jr music to CD Baby. FANS - Please checkout Mike Short Jr online! FANS - Please checkout Mike Short Jr page and sample / purchase some great new music! RadioIndy created a CD Announcement Press Release for Mike Short Jr on Digg.com!